Motivated by advances in technology and shifting employee demographics, companies – emerging and established – are breaking with traditional office layouts for modern workplaces designed to address the needs of the changing workforce. More than just a design aesthetic, these work environments are reflections of the teamwork and ingenuity that drive the promises of the future. At Rockford, we understand that by going beyond a desk and chair and constructing spaces to engage, collaborate and spark inspiration, we create workplaces where teams are not merely employed but belong. These work environments are reflections of the teamwork and ingenuity that drive the promises of the future. The culture, productivity and employee engagement of a company is strongly influenced by the workplace environment. Daylight, acoustics, ergonomics, technology and human comfort all impact the way we work. And while personal work styles vary greatly, most employees utilize a variety of spaces in the course of a normal work week. The Rockford team brings experience in a wide variety of strategies, systems, furniture and finishes that will support your design effort and your workplace goals. 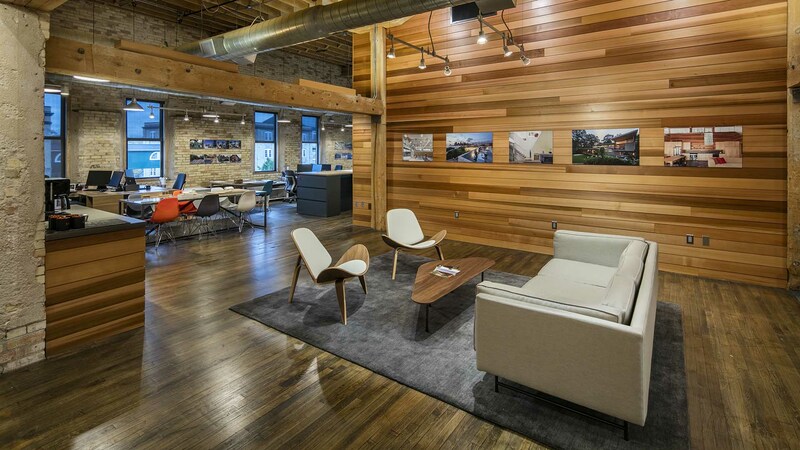 Rockford is a leader in creating workplaces that support design and research, collaboration and co-working.